After a while he saw three hags, and they blind of the left eye, before him in the road, and they having a venomous hound they were cooking with charms on rods of the rowan tree. And he was going by them, for he knew it was not for his good they were there. …Then he went over to her, and she gave him the shoulder-blade of the hound out of her left hand, and he ate it out of his left hand. And he put it down on his left thigh, and the hand that took it was struck down, and the thigh he put it on was struck through and through, so that the strength that was in them before left them. 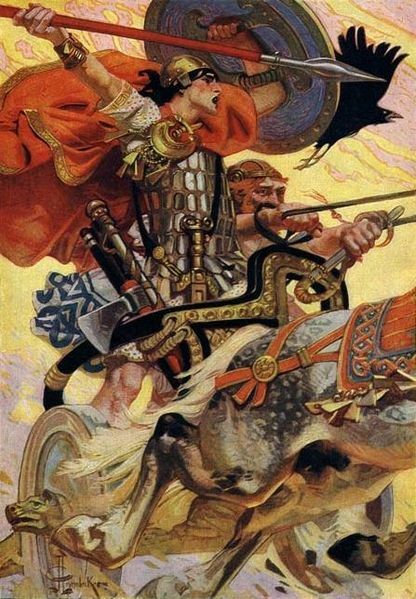 It couldn’t be more ominous, and presently, in forlorn battle against the odds, Cú Chulain is mortally wounded and straps himself to a pillar-stone, or standing stone, west of the lake of Muirthemne, so that he will not meet his death lying down: and his horse, the Grey of Macha, defends him with its teeth and hooves, until at last the hero dies and the crows descend upon him. Fans of ‘The Weirdstone of Brisingamen’ will notice that Alan Garner has used this scene for the death of the dwarf Durathror, who straps himself to the pillar of Clulow on Shuttlingslow, defending Colin and Susan from the morthbrood. But of course, one by one Conaire breaks all the geasa. He goes out to make peace between two of his subject lords, and travels the wrong way around Tara and Bregia to avoid raiders; he hunts the beasts of Cerna without realising what they are. And it was the Sidhe that had made that Druid mist of smoke about him, because he had begun to break his bonds. Three red bucklers they bore, and three red spears were in their hands: three red steeds they bestrode, and three red heads of hair were on them. Red were they all, both body and hair and raiment, both steeds and men. Lo, my son, great the news. Weary are the steeds we ride. We ride the steeds of Donn Tetscorach from the elf-mounds. Though we are alive we are dead. Great are the signs: destruction of life: sating of ravens: feeding of crows: strife of slaughter: wetting of sword-edge, shields with broken bosses after nightfall. Lo, my son! With great unwillingness the king allows the woman to enter, though not unnaturally “none of them felt easy in their minds after what she had said.” Finally, firelight from the hostel is spotted by Conaire’s enemy, Ingcel the One-Eyed and his army of reivers. They attack the hostel, great destruction is wrought, and Conaire dies. I place thee under geasa, and under the bonds of heavy druidical spells, that thou take me for thy wife before Finn and the others awaken. Evil are those geasa thou hast put on me, and evil, I fear, will come of them. He asks those of his friends whom Gráinne has not put to sleep what he should do, and they all agree he must follow the geas even if it results in his death, which of course it eventually does, though not before many others have died first. Wounded by a boar, Diarmuid explains to Finn that Gráinne ‘put me under heavy geasa, which for all the wealth of the world I would not break,’ and begs Finn to save his life with a drink of water cupped in his healing hands. But, thinking of Gráinne, Finn spills the water three times and Diarmuid dies. Maybe geasa were just a poetical, literary device, the equivalent of the prophecies about Greek heroes like Achilles and Oedipus, where the narrative imperative says that Achilles’ heel will be his undoing; that Oedipus will kill his father and marry his mother, etc. If not, though – if they ever had any real currency – you have to wonder. Could anyone use them? If so, how often? How carelessly? Could you do the equivalent of putting your children under geasa to pick up their socks and tidy their rooms? Or would that kind of thing backfire just as badly as most of them seem to have done in the tales? Geasa seem to have been impossible to refuse, however arbitrary or awkward they might be. Geasa means solemn vows, conjurations, injunctions, prohibitions. It would appear that individuals were often under geasa or solemn vows to observe, or to refrain from, certain lines of conduct – the vows being either taken on themselves voluntarily, or imposed on them, with their consent, by others. It would appear, also, that if one person went through the form of putting another under geasa to grant any reasonable request, the abjured person could not refuse without loss of honour and reputation. Interesting as these comments are, they don’t seem quite to cover the range and quality of all geasa. Was it a ‘reasonable request’ when Gráinne asked one of Finn’s faithful warriors to marry her under Finn’s nose at a wedding feast that had been arranged partly to settle an old enmity between Finn and her father? It’s true that Diarmuid doesn’t have to agree, but the unanimous decision of all is that though Diarmuid may decline Gráinne’s geasa, he will lose all honour if he does. When she sees Finn, however, she changes her mind. She uses the power of the geas as an extreme, last-minute measure: her only chance of escape. Other geasa, however, are more in the style of prophetic warnings or tabus. 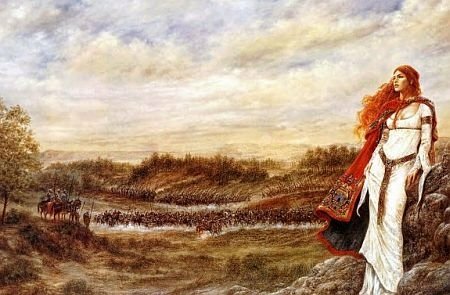 King Conaire is not to shoot birds, for example, because his father was a bird-man, the male equivalent of the swan-maidens of many folktales who can cast off their feathery skins and appear in human form. This is a straightforward tabu: you don’t kill the animal which is your totem, to which you are ‘related’ by spiritual bonds and by blood. But the complicated geasa about not going righthanded (sunwise) about Tara or lefthanded (widdershins) about Bregia, or following three Reds to the House of Red, or sleeping in a house from which firelight can be seen at night, these are prophetic warnings. They are not, perhaps, quite as inescapable as the prophecies of Greek myths. When the oracle at Delphi tells Oedipus he will slay his father and marry his mother, you know it’s a done deal. No matter what Oedipus does, no matter how hard he tries, this is what will happen. The event is foretold. In the case of the Irish King Conaire, however, the geasa merely indicate unlucky actions which ought to be avoided; and although the assumption is that some kind of bad luck will follow, they don’t spell out exactly what the consequences will be. Also, the prohibitions laid down by the geasa seem arbitrary: they are in themselves innocuous actions. We would all want to avoid killing our fathers and marrying our mothers. But most of us could ride clockwise around Tara, or sleep in a house with firelit windows, without coming to harm. The geasa piled upon Conaire spell out a sequence of actions and omens which will lead to his death; but he cannot know this in advance. For the reader, or for the audience hearing Conaire’s tale told or sung aloud, the geasa are a highly effective literary, poetic device for building up tension and the sense of approaching doom. And in the same way, the two geasa laid upon Cú Chulain – not to eat the flesh of a dog, and never to refuse an offer of food from a woman – having lain dormant for much of the tale, snap together like the jaws of a trap as the old hags call him to turn aside from his journey towards the army of Maeve to taste the meat of the hound they are cooking. It’s a signal that the end is coming, a sign of doom. And Cú Chulain cannot escape it, although the tale makes it clear that he has the opportunity – he may refuse, but not without dishonour, not without falling short of his own greatness. “A great name outlasts life,” he says – like Achilles. A young girl, thin and white-skinned and having yellow hair, washing and ever washing, and wringing out clothing that was all stained crimson red, and she crying and keening all the time. I can’t confidently answer the question of whether geasa were ever truly used in real life, outside the tales and the epics, but I would hazard a guess that they were, just as we know that the oracles were regularly consulted in ancient Greece and in Rome. I’m willing to bet that there were geasa - prohibitions, tabus - against the killing or eating of various animals associated with ancestry and with luck, like Conaire’s bird/spirit father, and Cú Chulain’s iconic struggle with the hound which gave him his name. Once Cú Chulain had – effectively – become a hound, as he did when he offered himself to Chulain the smith in exchange for the dog he had killed, then in a sense all dogs became his kin. Of course he could not eat them. I’m willing also to believe there were geasa or prohibitions concerning all kinds of other omens and lucky or unlucky actions or directions, because after all they still exist today: feng shui, not walking under ladders, not having thirteen at a dinner table. But the geas that one person could lay upon another, to compel them to do something even against their will and honour - that's something else again, and as far as I know doesn't seem to appear in other mythologies. Did it ever exist? Was it a metaphor for what we now call emotional blackmail? Or was it something far more fearsome and holy, reserved perhaps for special occasions, for religio-political purposes? Was it a remnant of Druidical power? Grainne - artist unknown, image from this link http://www.squidoo.com/diarmuid-and-grainne where you can find more Irish and Celtic stuff from http://www.squidoo.com/lensmasters/susannaduffy - if anyone recognises the artist please let me know and I will gladly credit him or her. Statue of Cuchulainn by Oliver Sheppard in the window of the GPO, Dublin - commemorating the 1916 rising. I have always thought that geasa are every bit as unavoidable as those oracles in Greek mythology - just as in a folktale, when a character is warned not to do something and invariably does, unintentionally, and you just KNOW that they won't have a happy ending. What a fantastic post, Kath! I have always felt Grainne's geas on Diarmuid was unfair. It's the same story as Tristram and Yseult of even, in my opinion, the ur-legend of Gwnwyfhar and Mordred (Madron).But this version takes all agency away from D. just as the later love potion motif does for Tristan and Isolde. Wonderful post, Kath. It took me right back there to the middle counties of my childhood (County Laois) and the wonderful tales around the fire. I LOVE the painting of Grainne, the russet-haired beauty in white.